Gridlocked world: where are the world's worst traffic jams? Currently, some 260 million people live in 30 megacities around the world. Traffic congestion is a major problem for pretty much all of them. According to current trends and forecasts, it is a problem that could soon become relevant for billions more people. In two or three decades, it is forecast that about 70% of the world's population will be living in megacities. But although the massive migration into megacities is expected to be quick, once everyone gets there they might well find that moving about will be a very slow experience. How slow is hard to say, though to get an idea, six BBC correspondents set out to find the world's most gridlocked cities. The freeways of Los Angeles are as fast as they are furious. Highways with a dozen or more lanes bisect this huge, sprawling city of 10 million people. LA was built for the mighty car - its once great public transport system overwhelmed by these concrete monuments to the motor vehicle. The locals don't like being locked down by the freeway - everyone has their favourite route across town over the "surface streets". Bette Davis was famously once asked advice from a young wannabe actor. "Take Fountain," she said, Fountain Avenue was her bet for quick route across town. For our race through rush hour LA we went for the "serpentine" route - avoiding the motorways and winding through the streets to try to make it from Hollywood to Santa Monica in an hour. It might be deep mid-winter in LA, but that still means bright sunshine and clear skies, which always helps. After getting tangled up in two breakdowns and a traffic light outage, the broad avenues of Beverley Hills swept us through the mansions of the rich and famous. Finally we reached the 405 Freeway - so notorious that when they closed it down for one weekend to add another lane, LA called it "Carmageddon." And then time ran out - 24.8km (15 miles), but not in a straight line, and not in Santa Monica. Traffic's tough in LA, but with the roof down and the amazing light it's not a bad place to be stuck. One of the first Russian words a Moscow correspondent picks up is probka - traffic jam. That is because we get stuck in them so often. I regularly spend three hours a day in traffic, going to and from work. And it is not just because of bad winter weather. Moscow's probki are all-season. Part of the reason is that Russian roads were simply not built for the volume of cars on them today. The local road rules do not help, though. According to Russia's highway code, any vehicle involved in an accident, no matter how minor, has to stay put until the traffic police turn up. That clogs up the highways even more. Last year, a police car crashed into my vehicle. The policeman admitted it was his fault, but we both had to wait in our cars for three hours until another officer appeared with tape measure and notebook to record the details. There are other factors condemning Moscow drivers to life in the slow lane. Double - sometimes triple - parking is common and can reduce traffic to a snail's pace. And police will often stop the traffic flow completely to allow a VIP, such as the president, to speed past. Not many in Lagos would admit that there are other places with worse traffic jams. The city's population is growing rapidly and there is limited infrastructure to handle this boom. But whereas a few years ago it could have been true that a Lagos road would have been one of the worst places in the world to find yourself, now there is little chance that you will be stationary, unless there is a broken down lorry, or the presidential convoy makes a visit from the capital city, Abuja. What makes traffic in Lagos a hair-raising experience, though, is the aggression and impatience from motorists looking to close up every inch of space on the road, accompanied by the perpetual soundtrack of car horns. Almost every vehicle has scratches or dents, an informal rite of passage. The main villains on these roads are usually the yellow minibuses, known as danfos, which can switch lanes in a split-second, sending nearby vehicles screeching to avoid them. Until recently, the major roads had swarms of commercial motorcycles, known as okadas, swerving and ducking their way through, based on whatever rules the riders deemed right. Their movement was recently restricted when the government enforced new traffic laws. The view through your windscreen is riveting enough, however. It can even be movie-like. Indeed, you can even buy popcorn from hawkers, many of whom have to sprint after vehicles, wares in hand, while doing the maths of their sales of anything from toilet seats to Hillary Clinton's biography. When this idea was first put forward, I envisaged Paris would be somewhere near the bottom of our gridlocked table. Most so-called Parisians live outside the historic inner city, in a patchwork of communes and communities that lie beyond the outer ring road. Each morning immense commuter traffic flows towards the centre. Many of the streets are narrow, and Parisians suffer from this one infuriating habit. They will sit in box junctions, at busy crossroads, oblivious to the traffic cutting across them. It makes for some extraordinary, life-sapping, traffic jams. Our particular experiment coincided with the first day of the Paris sales. Brave, you might say. And yet, once we were past the inevitable log-jam on the Peripherique, traffic in the city moved relatively freely. Perhaps that speaks more of the economic crisis in France today than it does of City Hall's attempts to tame the car. But Paris has made some huge strides to ease the stress for its commuters. They were the first European capital to introduce velib, which means "bike freedom". And today, for a modest outlay of a euro you can find a bike at almost any of the 1,200 automated stations around the capital. The public-transport system is one that most capital cities can only dream of. The Metro is fast, efficient and cheap. It is also dense in the centre. If there is one criticism, it is the gaps in the suburban rail network which perhaps explains why many still prefer the comfort - and the warmth right now - of the family car. In the end, 18.4km was a triumph. And I have to say, for the record, I am slightly peeved to have lost out to Los Angeles. Perhaps it is my local knowledge - or lack of it. Or perhaps it is the BBC's LA correspondent Alistair Leithead's expertise of the back-street short-cuts that is seemingly unparalleled. Beijing was once known for its bicycles. Not anymore. A little over a decade ago there were just a handful of cars on the roads. Now there are five million. Morning rush hour can mean a morning going nowhere. Sometimes the roads are shut down to allow official convoys to sweep through the city. China is the now the world's largest car market. The worry is that its cities will simply seize up. 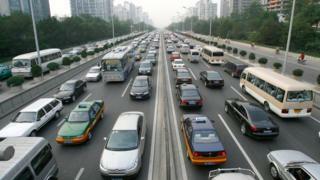 Beijing has introduced a car registration lottery to restrict the number of new cars hitting the road. But if there is one thing that China excels at it is building roads. It has built a staggering 300,000km in the past three years, according to the authorities. Getting behind the wheel is an important part of the Chinese dream. It is a status symbol. If you have the money, you want a Mercedes. Almost three-quarters of car owners are first-time buyers. In terms of traffic jams, we may have seen nothing yet. But in recent days, Beijing has been blanketed by hazardous smog. Car exhaust pipes pumping out fumes are part of the problem. For now, the talk here is not about traffic jams, but how to reduce the city's appalling pollution. Mumbai is known for its bad traffic jams. The longest I've spent in gridlock on a Friday evening was four hours, for what should have only been a 20-minute journey. Stories of being sandwiched bumper to bumper for hours on end are part and parcel of life for people living in Mumbai. The real commuter hours start about 09:00, but our race against Beijing had to start at 08:00, which gave us a bit of an advantage. Had we done this experiment an hour later, there is a good chance we would have barely driven 10km, rather than the 24km we managed. The drive is a bumpy one to say the very least. The city's infrastructure and roads are in some parts extremely poor, so it is difficult to shut your eyes and sleep. The incessant chorus of beeping horns would wake you up anyway. But looking out of the window is far from boring, passing the seafront, slums, shops, and even encountering the odd salesman. Stop at a busy junction, and a sea of workers, clutching everything from books to toys to feather dusters, all spring into action, trying to sell you their wares before the light changes to green. Some improvements are being made to the roads here. New flyovers and toll roads have been built, but it is not fast enough to keep up with Mumbai's growing population. The pace of change, you could say, is a bit like my Friday night commute home. Can car sharing eliminate San Francisco's traffic jams?